Description: Our gray universal absorbent pillows are filled with super absorbent polypropylene to soak up spills fast. Can be wrung out and reused. Available in two sizes. Uses: This general purpose absorbent pillow can be used for everyday maintenance, repair and general operations. Absorbs water based fluids, oil, diesel, gas, coolants, cutting fluids, hydraulic fluids, vegetable oil, acetone, turpentine, ether, MEK, hexane, trichloroethylene, etc. Additional technical information on order page. 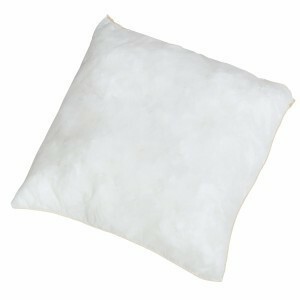 Description: Our white, oil only absorbent pillows quickly soak up oil. 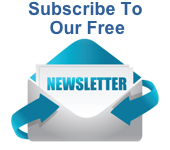 Polypropylene filled and available in two sizes. Uses: Use on land and water when you have oil to soak up. Absorbs hydrocarbons only. Repels water. Floats on water. Absorbs all hydrocarbons such as oil, gasoline, fuel oil, diesel and lubricating oils. 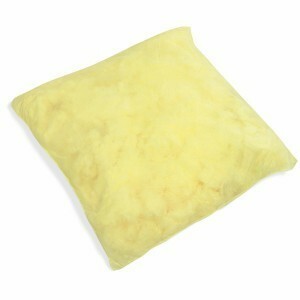 Description: Our yellow hazmat absorbent pillows are filled with super absorbent polypropylene. Large surface to quickly soak up chemicals. Available in two sizes. Uses: Use on hazardous or unknown liquid spills. Absorbs all liquids including water. For aggressive fluids such as caustic soda, hydrochloric acid, sulphuric acid, sodium hydroxide and nitric acid.